Jean-Claude Juncker today ramped up Brussels' bid to derail Brexit - urging Remainers to find a 'way out' of leaving the EU. The European Commission president said he would 'facilitate' the UK if there was a change in policy about cutting ties with the bloc. Admitting that he felt personally responsible for the looming 'catastrophe', he also vowed to keep making the point that Brexit could be reversed despite admitting it was causing 'irritation' inLondon. The comments, in a speech to the European Parliament in Strasbourg this morning, are the latest stage in a concerted effort by top Eurocrats to avert Britain's departure. 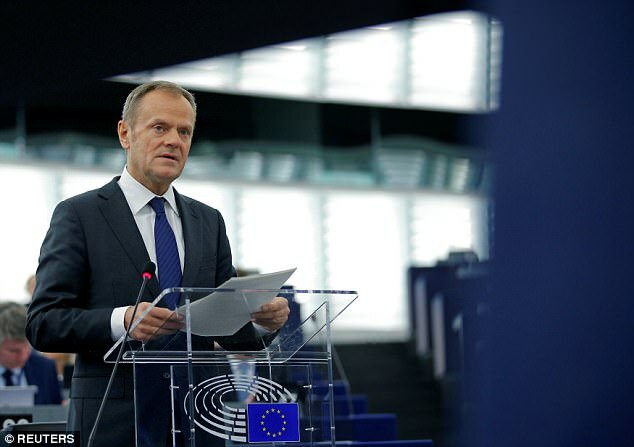 Yesterday European Council president Donald Tusk told Britain there was still time for a 'change of heart', adding: 'Our hearts are still open to you'. The appeal follows debate in the UK about the possibility of a second referendum. The prospect of halting Brexit was fuelled last week when Nigel Farage seemingly endorsed the prospect of another referendum - although he later backtracked. Brexiteers condemned the idea of a rethink as 'absurd' and warned Brussels was trying to destabilise Theresa May ahead of crucial trade talks. 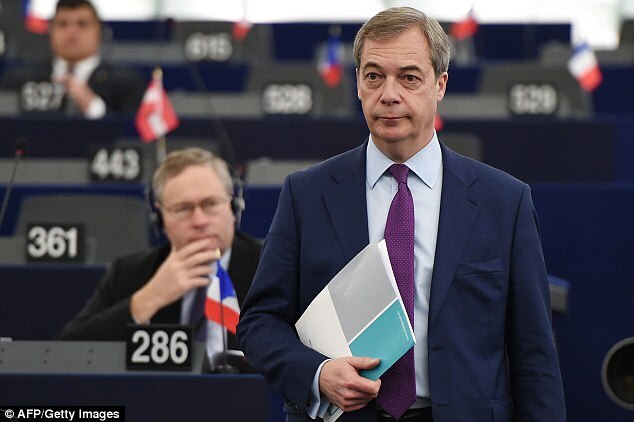 Taking to his feet in the European parliament after Mr Juncker today, Mr Farage stormed: 'I fear that you are all working together with Tony Blair and Nick Clegg to make sure that we get the worst possible deal. Last night, the PM used talks with Austrian president Sebastian Kurz to send a message to the EU that she had no intention of reopening the question. 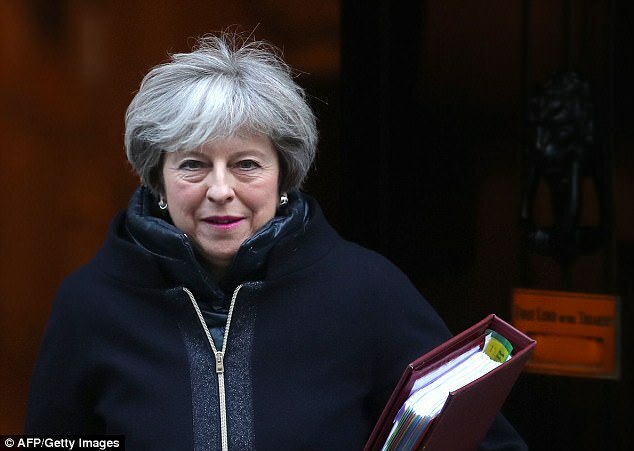 No10 said she told Mr Kurz, who is due to hold the rotating presidency of the EU, that 'the Government will respect the decision taken by the British public to leave the EU'. Downing Street also rejected suggestions that the free movement of people could stay until a possible transition period ends in 2021. Speaking in Strasbourg today, Mr Juncker suggested that the UK would be allowed to reverse the Article 50 process of leaving the EU. He also said that even after the formal departure date in March next year Britain would be allowed to rejoin. 'Our hand remains outstretched. The UK people, the UK government, may wish to find a different way out,' Mr Juncker said. He added: 'I did note that in London there was a rather irritated response to this proposal. 'But, note that even if the British leave according to article 50, then article 49 would allow them to accede again. 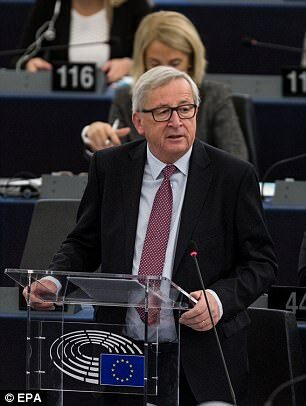 Responding to a written question from an MEP about whether he felt personally responsible for Brexit, Mr Juncker said 'I still feel the exit of Britain is a catastrophe, yes, a defeat we all have to take responsibility for. French president Emmanuel Macron also added his voice to the charm offensive. During a debate at the European Parliament yesterday, senior figures lined up to berate Mrs May and the UK government over Brexit. German MEP Manfred Weber, a key ally of Chancellor Angela Merkel, said the only 'real thing' the PM had managed to do over the past 18 months was announce British passports were turning blue. And he said that was a 'scam' because there were no EU rules dictating the colour of identity documents.